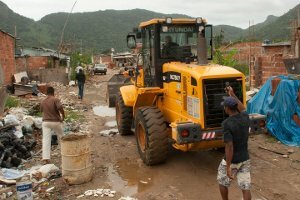 The morning of November 12th, 2010 – Despite a concerted resistance effort by residents of Vila Taboinha and frantic action by community groups and the public defenders earlier in the week, a bulldozer, supported by a police team, rolled into the community and started demolishing houses. 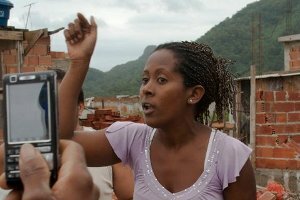 Late the previous day an agreement had supposedly been reached between the community and the Housing Sub-Secretary of Rio de Janeiro, which would grant Vila Taboinha a 30 day reprieve until the residents and their houses had been registered by the prefeitura. However, registration was still taking place in the community hall as the bulldozer began its work. Early claims that the houses to be demolished were uninhabited turned out to be unfounded when representatives from Catalytic Communities (CatComm) arrived in the community to document the demolition. The houses which were demolished were indeed inhabited and their residents were at the scene to witness the homes, which they had built with their own hands, reduced to rubble. By the time the two representatives from CatComm had arrived, about half a dozen homes had already been bulldozed. As soon as they started filming the bulldozer pulled out and parked, the driver unwilling to continue under a foreign gaze. The two were then immediately apprehended by police who demanded they hand over their documents, attempting to intimidate them with empty claims that their presence and activity was illegal and that they would be handed over to the federal police. The team calmly stood their ground to the rising consternation of the police who, in their floundering for leverage, let slip the truth that hangs, unspoken by the government, across all the favelas of Rio: “We don’t want to show this”. What followed was nothing less than electrifying. The community, fortified by the presence of foreign eyes, courageously overcame their deeply ingrained terror of the Polícia Militar and rallied in support of the Catcomm volunteers, quietly closing a circle around the scene, welcoming the volunteers to the neighbourhood, calling out support, denouncing the police intimidation and bearing witness with a dozen camera phones extended, filming the confrontation from every angle. The police were paralysed, unable to carry on their charade under such inescapable scrutiny. 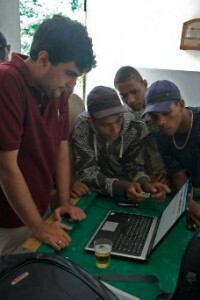 The documents were returned, the team released back into the embrace of the community. The Bulldozer slunk out, defeated for one more day. That afternoon, the young, newly inspired journalists from the community gathered with Catcomm and members of several other community groups to collaborate and exchange footage. There, on a broken pool table, as the bytes flew back and forth between devices, the knowledge was breathed into Vila Taboinha that the eyes and ears of the world could now be reached. This article was written by Sam Faigen, and published on November 15, 2010.